Presenters John Craven and Johnny Ball search Hampshire and Dorset for antiques, aided by experts Charles Hanson and Philip Serrell. Browse content similar to John Craven and Johnny Ball. Check below for episodes and series from the same categories and more! -We're having our first tiff. -Their mission, to scour Britain for antiques. -The aim, to make the biggest profit at auction. -Go to work on a little shopping list. -Time to put your pedal to the metal. Today's celebrities are two ground-breaking TV presenters. -Mind your hat doesn't blow off. -Oh, no, that'll be all right. -I'm just warming up the tyres now. Yes it's Johnny Ball and John Craven. Hello. And there's good news tonight for Tom and Jerry fans. of other world's first news programmes for children. We'll be back again on Tuesday. Bye for now. making maths and science cool. You're obviously interested in anything to do with mathematics and science in general and I'm not. I think we'll be going for different things, actually. Today's experts, auctioneers Phil Serrell and Charles Hanson are big fans of the two Johns. -Are you happy to meet and greet Mr Craven? -Yeah, yeah, yeah. They're both legends, aren't they? you know, in my shorts...watching the telly. -You weren't nearer the 1880s, were you? -I'm going to punch you in a minute. took off with yet another hugely popular factual show. In Britain there are 22 million sheep. John's still at the helm and in the country. Whoops! -I quite like small agricultural tools and things like that. -Anything really involved in the countryside. -So Countryfile's rubbed off on you. -You become what you do, don't you? That'll be music to the years of potential partner Phil. driving a 1960s MGB and a 1966 Mercedes-Benz 250SE. -Well, my first car was a Heinkel bubble car. -A little bubble car. I paid £200 for it, I remember. And I sold it because it was eventually using more oil than petrol. before heading north to an auction in Oxfordshire at Watlington. -That's a plus, isn't it? -Morning! Wow! How are you? -Whoops! I think there's a handbrake somewhere. -Yeah, put the brake on. -I think you two are going to get on really well. -So am I with you? -Oh, the hats versus the non-hats. -Great to meet you too. We'll go in this one and you have that fiddly little thing over there. A beautiful old British sports car. -This is us. See you later. Shall I drive? -There's just one minor problem. So with the motor running, let's head out onto the highway. Hats in one car and country boys in t'other. But I'm going to need your help a lot, cos I don't know an awful lot about antics. -Well, you're in good company. that's probably about right, although the 10th century version of it translates as "border wood,"
which reflects the towns location on the edge of the New Forest. So let's see what they've got, shall we, Phil? I think I'm going to wait for the corporation dustcart to go past. I might be some time! complete with its own workshop for restorations. -Lovely to see you, my love. A fair bit of all this treasure will be beyond John and Phil's budget, of course. -I was just thinking you could do a, "Argh, Jim lad!" So what's the plan, maties? -Tactically, I think we want to try and find something perhaps a little bit unusual. -These type of things are lovely, but they've got a standard saleroom price. -So what we need is something that nobody can really guess how much we've paid for. -You got it in one. That bit of pastoral paraphernalia might just do the trick. -That's a grain measure,, isn't it? you know, well over 100 years ago. -A lot of these are French, aren't they? -Yeah, I think this is. -I can't quite make it out. That is £48. It says 1880 circa. -Shall we put it on the table? for dried flowers in a big farmhouse kitchen. -It looks really good on this table. Perhaps we should buy the table. -You think that might sell? -It's a possibility. Let's see what else we can find. -Carol, are we all right to put these on your table? It's a bit unlucky to put shoes or boots on a table but, never mind, we won't worry about it now. -It's new shoes you shouldn't put on a table. -Oh, is that what is? OK.
-Old ones are really lucky, Carol. -Don't believe a word of it. -and nobody would wear them, they'd just be for decoration, wouldn't they? -You could perhaps do something on those? -Yeah, of course I can. -Let's see what else we've got. but what about our other pairing? -Anything in common, apart from the hat? -I think we're quite similar. I think we are. I think we're both quite quirky. could be the way we'll go today. Are you, Johnny, a bit of a negotiator? I'll be saying, "Johnny Ball, please reveal all."! and I'll then come in as your wingman and give you some context, OK? They're also heading for Ringwood. -I'm fine. Lovely sunny day. -And pretty in pink as well by the way. -Thank you very much. Hello. -Hello, Johnny, nice to meet you too. -May we enter your emporium? -Yes, of course. You're most welcome. -It looks like Lorraine's shop requires a thorough search. I think I'm the oldest thing in the shop. I go back some time, you know. -Which has surely got to help. -What a great pair of jugs. -Can you say that on television? -They carry, Johnny, what we call the Bretby Sunburst mark. for Bretby of Burton-upon-Trent, near where I live. -Yeah, possibly the beer or perhaps mead. -It could be for mead. -Absolutely right, with the bees on. The only issue I've got on my jug is there's a chip here. -I saw on that one, that one's worn on the handle. that would've happened during the firing, so that goes back to when they were actually fired. So these are seconds, so we can knock half of that off. -I suppose we could come to some agreement, couldn't we? Cheeky! I think they're interested in those. -What's the very best price on those, Lorraine? -What was on the ticket? -85? Oh, dear! What are you going to offer me, then? Well, my man here carries the money. -I would... Lorraine, what's your very best? We would think 30 or 40, because then we might get 50 back. I was thinking more like 45. -I have to be guided by someone. -I wonder, 40 and a kiss. -One from each of us. -35 and two kisses, why not. And he said he wasn't much of a negotiator. What's happening elsewhere in Ringwood? doesn't go too well auction at the moment. -Oh, what have we got here? What is this? Well, I think it comes from a seaplane. -What the propellers of a seaplane turned into a table? I think that is really unusual. I've never seen anything like that before. Can I pick it up and have a look? -I think that is... I think you've struck gold there. -All depending on price, of course. Is that for the...for the pair? -That is the for the pair, but I suppose I would split them if you were just interested in one. My maths is awful. I should've had Johnny Ball here, really. So 345 divided by two is about 80, isn't it? -Eh, everybody's in a bit of a cheeky mood today. -Well, those are a possibility, aren't they? I could probably do them at 120. I think I'm warming to this lady. I love them. I do love them. I think they're funky. Shall we take that with us into the other room into our little collection and see where we go? If that's going to be our big buy, I think we need to just forget those. Yeah, let's give 'em the boot, shall we? It's all down to price, but we like that, don't we? We both love that. -Now, I like this because of its kind of agricultural nature, you know. I don't suppose you can get this on Countryfile before the auction? -It might just increase the provenance a little bit. -Carol, we'd like to buy those two off you. -And I think at auction that's probably 30-50 quid. If it sells for 30, we'd like to try and buy it for 20-25 quid. -Would you like to pull up a chair, Carol? -I'm going to need that. And I think that at auction is going to be perhaps £100-£120. -Which means we've got to try for that for about 80. -Which is putting the two in at about £100-£105. Right, well,,, I can't do that, but I'd do 120 for the two. -Can we meet you halfway? -Well, it's a nice sunny day, why not? -I'm trying to be an angel. -Let me shake your hand. The first deal I've ever done. You wouldn't like to throw in the champagne flutes as well? -Sure? Then we'd really toast you. -I think his first deal's gone to his head. So, a table and a grain measure for £110. No, they're not cuff links, they're silver buttons. -Are they quite early, do you think, Lorraine? -There's no actual date mark. You have got the lion on there, but I couldn't see a date. And one more thing I saw here, this is quite nice. Look at that. -This is very you, isn't it? Lorraine, we're looking at a few things. Just this lighter here, it is Chagrin, isn't it? -And that goes back to the Jazz age? -English or would you say...? -I'm not sure if it's got a maker on the bottom. -We don't catch a lot of sharks here, do we? -No, I haven't seen any in Ringwood. Not until today anyway, Lorraine. Lorraine, if I said to you... May I speak on your behalf? -You may speak on my behalf. and the little cigarette lighter? -Would you take 25 for the whole lot? -No, no, no, I can't! -Final best price is 30. -OK. Shake her hand. We'll take them. Thanks, Lorraine. That means the silver buttons have cost us...? -The silver buttons have cost you 25. And a fiver for the lighter. -And we've just bought that fine pair of jugs for £35. Oh, look at this! One, two, three, four, five, six. -That's fantastic! Oh, and another kiss. Mmm. Oh, I say! -I didn't really need you with me, did I? I reckon Charles is going to have to watch out, actually. Time for a celebrity driving lesson. I haven't driven a gear-change car for about 25-30 years. I've been driving automatics, so if I forget to change gear, will you forgive me? -Do you want to just pull in and let me get out? Mind the indicators too. But now for a brief shopping time-out. as the father of modern scientific archaeology. -And what did you say his name was? -Augustus Pitt Rivers, bit of a hero of mine. -Augustus Pitt Rivers is a great name. to explore the lives of ordinary people and the founder of not one but two museums. -Good to see you as well. -Yeah, welcome to Salisbury Museum. creating a collection that's sure to appeal to John. from places like Cyprus and from the Far East which he put on display. -In fact, we've actually got some of the items he brought here that I can show you. -What on earth is that?! -Well, it looks like it should fit on a beast of some sort or another. -Well, absolutely, yeah. It's a Neapolitan saddle. Well, it's called a saddle but it was actually for attaching a cart to the horse. -That would be a really impressive thing, wouldn't it? -And how old is that? -It's 19th century, we think. -And how did he start his collection? and this idea that evolution could be applied to objects. -Did they know each other? and he applied those theories to the material object world. So he started to think that you could look objects in the same way that animals evolved. and then the back becomes raked and a stool develops into a chair. like this 19th-century mill from Dorset and this Chinese rice winnowing machine. But why would he want that? He wanted to educate local people about farming practices around the world. that showed people in Dorset how people worked and farmed all across the world. -And also how things were pretty similar around the world. and the lot of somebody working on a farm in Hong Kong. from the mid-1880s until his death in 1900. -Well, what do we have here, Adrian? from his excavations on Cranborne Chase. from these models here is that he was a methodical archaeologist. He recorded things in huge amounts of detail. Because before him archaeologists were really more like treasure hunters, weren't they? whereas the general was interested in finding out the mundane, things relating to people's everyday lives. could provide vital evidence to understand the past. when in 1882 he became Britain's first Inspector of Ancient Monuments. It was the first step towards the state safeguarding our heritage. he travelled throughout the land recommending sites for recognition. He was an amazing man. Would you like to have known him? -I think makes someone quite remarkable. which is why he could make this vast collection. Any idea how many things he did actually collect all his life? He must have bought in excess of 50,000 objects. -Lovely to see you, Adrian. Our trip now heads south towards the coast and Boscombe in Dorset. Gosh, think of a number. We have spent how much today so far? We have spent how much? How much? -We have spent 65 quid. -For a load of old tat. No! No! -Stuff that's going to make us a fortune. They could do with Johnny perhaps plumping for something he likes. -Spread the blame a bit, eh? Hello. Charles. Good to see you. Nice to see you on this lovely day. -We're here to buy one of everything. -But we might run out of money. -Yeah, you're the maths man, Johnny. It's quite charming, isn't it? -Look at it. Late Victorian. Isn't it charming? -I think it has legs, don't you think? But if he can just find something that speaks to him, who knows? You've got to press that button there and it flips up like that. -And now you lift up the receiver. -I think these could be a good buy, you know. -I'm sorry, I've got to go, I'm wanted on the other phone. -What do we know about them? I think these are military issue, aren't they, Johnny? They're really interesting. Er...Second World War. Oh, you charge 'em with this, don't you? I don't know if that's charging. I'll know if I get a belt off it. -I think that sounds the bell usually, Johnny. -Claire, how much are they out of curiosity? -Mental note, Johnny, for a second. -I'm making a mental note of that. -We might come back to that. -We'll walk on for a sec. -So one possible purchase. Anything else? and when I was in the RAF I had a haircut like that. -And I was called Meckie cos I had a face like a pig, I suppose. -They were cruel to you. -It toughened me up. Toughened me up. famous for their teddy bears. -He's right. He knows what it is. Privets, you just go... and keep going, you'll get everything. -Oh, yes, look. "Sponge's garden hedge trimmer." -We knew, but I've never seen one. I love that. I bet it cuts a card...a business card. -Oh, do be careful, chaps. -Oh, God! This is dangerous! -Yes, put that in there. -That is a neat cut. -Almost took my finger as well! I'll cut a corner off now. -That's enough, that's too close for comfort. -How much will this be? -I would like to do that, because it's so novel. -Just for the novelty value alone. which I think have a bit of mileage in them. -Let's put them in the equation as one lot for the auction. -Johnny can have those for 15. -Wow! I think that's good value. And if we put these in the array as well...in the arena. The best on these two would be? -She's not moving on those. She's not moving on those. -You want a nice round 50. -For the three? Yes, you can have that. And now you're going to say something else. I think they might, judging by the way Johnny's hugging that squirrel. How much will they cost together? If you want those three, you can have those for 50. They should be 25-30 each. -I can't do any less than 50. No, sorry. -I'm not sure about the phones. -Not sure about the phones? -No, I'm sure about the others. -I'm sure about the phones. -Yeah, I'm sure about the phones. -That's teamwork. You want to be different, don't you? -We're sort of the Brazil of the antique world. But we can make mistakes as well, can't we? Does that include own goals? They've not agreed on anything. So it's all in - wham, bam, thank you, ma'am! - £100. -Done. Yeah, we'll take them. Yeah, thanks a lot. That's a lot. -Shake the lady's hand. Thanks a lot. -Thanks. Give me the money. -It's so easy to get rid of it. Thank you ever so much. -That's your eighth kiss today. Jealousy will get you nowhere, Charles. So £100 for the phones, clippers and toys. And shop shut, it's now time to get back to our starting line-ups. -I think we've got a problem. Try pressing a different button next time. I'm glad we're not stuck behind that. Not...not that we can actually move. -We might need a bubble car for them tomorrow. -A perfect day, isn't it, for a open car and the countryside. ..en route to an agreed rendezvous. Well, someone must be going the wrong way. Yesterday, Johnny and Charles bought a large amount of stuff. a sharkskin lighter...and a hedge trimmer. That lot cost £165, leaving £235 to spend today. and a table made from a flying boat propeller. -I think you've struck gold there. so they still have almost £300 in their wallets. They may well need it, too. I do have the intention today of probably buying up to six lots for the auction. and we've got two shops left and I was thinking if we buy two in each shop, so that's us six as well. to me to us to me to you to you to me. And although yesterday Johnny Ball enjoyed the Merc, John Craven's got other ideas today. -Can we get in that one with two hats. but our next stop is the Dorset village of Lytchett Minster. John, that was a masterstroke swapping cars this morning. -Well, I think we deserve it. I mean, the MGB is a lovely little car but this is a nice big car! -This is a gentleman's club, isn't it? It's an elegant cruiser, isn't it? Ever deeper into the country, Phil's thoughts are taking a familiar turn. -we can rock up and try to buy something from. -Are we allowed to do that? -The rules are how we make them. and for once he seems to have found a kindred spirit. Mind your head. Tiny little shop. -Hello. Hello, nice to meet you. -44 years I've been here. -Getting the hang of it now? Dorset buttons, what's that then? -Never heard of Dorset buttons? -I haven't heard of Dorset buttons. Dorset buttons were the biggest industry that Dorset's ever known. And they were made in Dorset for 300 years. They're all hand-stitched in linen thread. Thelma's even written a book about them. and John's not wasting any time. What do you think of this then, Phil? Arts and Craftsy, but I think that's really nice. -A firescreen, isn't it? Is that copper? -No, it's brass, I think. -She's almost eastern looking, isn't she? -Yeah, she is, isn't she? -And I think it is around about Arts and Crafts era. It's got some stainings on it, do you think they'll come off? -No, I think we should just leave that the way it is. -We want to present an undiscovered jewel, that's what we want to do. -What's your ticket price on that, Thelma? -isn't he? Cos I need to make a bit of a profit on it. -Oh, well, since it's you. -Do you think that's a good buy? -I think that's a really good buy. -I think that's a very good buy. -Thank you very much, Thelma. -There we are, look, in the tin. -But there is something else Thelma can help with. This is an off-beat question this, are there any big farms around here? -Yes, there's Post Green Farm just up the road here. to see if they would be receptive to John and I just appearing on them? -This is your thinking, to go and see if there's anything worth buying? -Yeah, if we can go find a farm, it'd be lovely to go find old equipment. -has brought them just up the road. -Here we are, Post Green Farm. -I wonder what the farmer will be happy to sell? -We spoke on the phone. -How are you? Good to see you. -And you've got something for us maybe? -I got something you can look at. Beware, Chris, once introduced these pests can be difficult to get rid of. Oh, look at that cart. That is just a bit out of our budget that, isn't it? Yeah. What era is that do you reckon? I would have thought it was sort of between the wars. -A bit earlier than that, I think. -Not for sale! But what is? -This is the silage knife. -Cut it into the silage. -Make it into the silage and make nice squares. -Chop a square out. Yeah. -I think that's probably a bit too rough for us. -We've got the things that go up like that. -Those are wicked. Have we got four. -Three or four. Four there. -They are big, aren't they? -Staddle all stones should tickle John's country interests. -These were formed in...the 19th-century? -Yes, I would have thought so. and put the mushroom tops on and then create a base and then put your haystack on top. Going back to the old days of haystacks. And that meant there was air coming up and it stopped the rats coming up. These are very much part of farming history. I think they're lovely. How much would you want for two of those? -Oh, 50 for the two. -I'm nothing to do with this. -The price of beef has gone down for farmers. -Yeah, lamb's gone up though. And milk prices have gone up. Hey, never mind Countryfile, this is turning into Farming Today. -Honestly, Phil, do you think they would sell? This architectural salvage stuff is actually quite sought after. I think you'd be looking at £200 each for them as straddle stones. -Yeah, I do. Shall we shake the man's hand and then find out what they're worth? -This could be interesting, couldn't it? Thank you. -Thank you very much indeed. This is the man with the money, Chris. -I owe you a fiver. -And we now own two staddle stones that we don't know the value of. -And we don't know if anybody will buy them without the mushroom top. Bit of a gamble, Phil. But we've seen him splash out on quirkier items, haven't we. Not heavy though. Mind your back. Now, what about Johnny and Charles? Two hats in a hurry, I'd say. As they manoeuvre towards the Dorset Downs and Blandford Forum. Blandford Forum. I love it, I've been there several times. to a museum dedicated to a vital supporting unit of the British Army. Welcome to the Royal Signals Museum. This should interest a technology buff like Johnny. -who was the messenger of the gods. -It's both, the same bloke. Communications in war has meant life or death since ancient times. the British Army has its own specialists. -shutters to make your letters. from navy ships to the Admiralty. that communications technology took a huge step forward. and it was the first use of electronic communications on a military battlefield. but obviously the military saw a use for it. and getting it back within months, it was within minutes. to keep the public informed about how badly the war was being run. actually laid their own undersea cable. and they had eight telegraph offices. At the Battle of the Somme, they laid 50,000 miles. it was superseded by some astonishing feats later on. getting the message through by any possible means. -This is Pigeon 2709 and it is the real artefact. and didn't get there until 10.35 the next day. So it was something like 21 hours in flight. but it somehow managed to get that message through and then died on arrival. -Did it have a name at all? -No, it was just known as Pigeon 2709. But this is the kind of message that they would use. So this is actually a real pigeon-carrier message carrier. And what you'll find is inside there's a little message there. and they carried on making quite a contribution. wasn't sent by electronic means but was taken by pigeon. that would easily fit in here. So what better opportunity to find out more about them. These two are Second World War variance. They're called the Tele F.
Came in late 1945 the MK II. I've no doubt these were mainly used in the European campaign post D-Day. -And you've got one almost identical in here. -There's one almost identical in your cabinet. -That's right. That one was actually used during D-Day. -So they've got great historical significance. -But as with anything... the value is dependent upon on the condition and the provenance. they would be extraordinarily valuable. They still have a value and these are in relatively good condition. can be from £20 up to about £50. Well, that'll have them looking forward to the auction. But first there's a chance to acquire a valuable new skill. are visual communications using flags. and he's going to send you a message via semaphore. -What's that? Is that L? That's a J to start you off. You send that signal back to say you've read it. -Now he'll start his message. Oh, dear. Now they're having a go. Look out! OK, that means, "Let's go." These two are never going to be quite on the same page, are they? -That's it! What was that? John and Phil already have their shop tactics finely honed. Shall we split up or shall we just keep on working together? has been a winning combo so far. Yeah, we've been a good team so far, haven't we? towards the seaside once more, and Bournemouth. Especially rich in literary associations, is Bournemouth. Romantic poet Shelley LITERALLY left his heart there. whilst staying in the town. Now, what's the story of Molly's Den, I wonder? -This place is massive, isn't it? Yes, it's a bit of an epic, I'd say - packed with all sorts! -Just goes on and on, this place. but it turns out this team has a third member. she gave a bit of a list before I left home. "Look out for silver spoons that have got good hallmarks on them. "Nothing with bumps or chips in it. "Nothing Victorian," she said. "Go for Art Nouveau or Deco." So I got quite a list here to work on, a little shopping list. Sage advice, eh? Perhaps we should have booked Mrs Craven, then. Still, at least Phil has his uses. -It's so nice, isn't it? Do you know what? I'm older than that is. -It might be...three weeks old? We're going to find an antique. That IS the point, after all. Now, what about our leading semaphore duo? At least, I think that's what it means. Wow! Look at this! Ho-ho! -Oh, very nice. Very nice. -..a smell of pine, hasn't it? That's the smell of antiques in the afternoon, gentlemen. The reason I like this - can you see it's got like an orange peel effect? that is laid on to a stoneware body. -You think it's that age? I think it's quite early but not overly old. But you did buy jugs yesterday, Charles. It's got a few chips. You know, it's got some age. -there weren't that many things older than you? -You're in good condition, mate. -Nice to meet you. You're more than welcome. -It's an old, painted pine box. -May we pull it out, Tony? -I'll have a look at this in a minute. -May we lift your end up? Is that not a croquet chest or something? -No, it's bigger than a croquet one. -It's too big, isn't it? Too big. -And it was lockable at one time. Oh, I can just see... Can you see that? It says GNR. -So I think it's perhaps of railwayana interest. -Charles is taking over here a bit, I think. -How much would it be? -How about if I said £20? What is it worth, Johnny? -I'm not keen on it. So I would say, for me, a fiver. Would you take £10 for it? -No. No, I don't think so. -I'd like to buy it, Johnny. -Right. We're having our first tiff. Come on, you two, think like a team. No "I" and all that. What about this, look? Now this, I think, is absolutely beautiful. -but that's a clamp for a table or a bench, right? Oranges wouldn't come out of there. It's not big enough. -I think it's as it says on the actual cast iron. You've got radar eyes, you have. He keeps them PEELED, certainly, Johnny! So you'd quarter the oranges first? Right, got you. You do it that way. to keep that... And then this goes... What happens to this? -That just slides across to slice it off. -Have we got price on this? Have we got...? -Would you take 15 for it? -How about if we said 30 for the two? We can't put those in the same lot, they're so unlike each other. -And I think we might have too many lots. and see how the opposition are faring. -I just found that down there. -Oh, I saw that earlier. It's early 19th century. Moulded half columns. These are called bell-push mouldings. Because they're like a bell push. That, at auction, is going to make...30-50 quid. It's a bit of brown furniture. -Yeah, I was told, "No brown furniture." Have a look on that list again. Did it say mirrors? -She's not on the phone, is she? -We can phone her, could we? -Just ask what she thinks about mirrors? -Or should we just take a risk on it? What will you accept on this one? Um, just give us a second, I'll come back to you, John. -We'll continue to have a look, all right? -Can I leave that there? -Yeah, I'll take it. Thank you. -Don't let anybody take it, will you? Any news on Johnny and Charles's dilemma? CHARLES: Shall we buy the box? If you... Look, you are the boss in the end. I've only got the money. -"We'll buy the box," OK? Shake the man's hand. Shake his hand. Thanks a lot. So, one box for £10, but what'll go with it? but Charles prefers the cider jug for the same price. Johnny's taking a lot of convincing, though. I would love to buy the jug. -So we're not having the other two? -We'll take the box and the jug. We're taking the box and the jug? And make a little liquorice all-sort of lots for the auction. -We're not making marmalade, we have to buy marmalade. I'm looking at you and I can't believe what you're saying. I can't believe what you're doing with our money. -So that's an attractive jug? -And that's an attractive box? -And we go, go, go. I think this is all about to kick off. What did you say? Stupendous? The marmalade cutter will make money. It will make money. -I would definitely take the jug and the box. Have you got boxing gloves? because when you put the two together, you will devalue both. I think it'll make £30 plus. All day long. So the marmalade cutter and the box. I don't want it. Go on, I'll take it, because you're the man. -Here's one for you. Two for you. Three for you. -Thanks for keeping out of it, that was very good. Compromise pulled off, but what a fuss over £20, eh? John and Phil have got a deal for £25 on their mirror. -Will you go for that? Mike Oldfield, Tubular Bells, mandolin! I can't play it. How much is that? -1900. This looks like it's sat in mahogany. -I mean, I wouldn't want to go and make that for 50 quid, would you? These things are by and large Neapolitan. And how do they go at auction? This kind of instrument? I actually sold a mandolin last week for nearly £1,500. -Oh, really? We'll buy this one then. -But it wasn't that one. that Phil's let John do the deal. I'm torn between these two, so what's the best price on both? OK, we can do 35 on the mandolin. -And 20 on the crib set. I think that this is probably going to sell better in the auction. -That is the very lowest, is it? -Yes, I'm afraid it is. I'll take my mandolin and go play. Not yet, John. No swimming, either. With the last deal done, it's time to see what's been bought. Three, two, one, up and away, look at that. John Craven, look at that. -and we think it's a bargain. -Great Northern Railway. It was £10. -..or you can do like that. Isn't that lovely? Cutting devices in one lot, sharp thinking. Marmalade, that's what it is. Gordon Ramsay would snap that up. We do like these jugs, because they are beautiful. -John Craven, look at the jugs. He's not like this on Countryfile. 1930s, Art Deco, look at the exterior feel about them. -Yes, but about George III. How can that be connected with some Georgian silver buttons? We bought him at the same time. Don't look for logic in it, chaps. -Hey-ho, how about all that? -This is a grain measure. A grain measure from about 1880. Our mirror, which is William IV Regency, bell-push mouldings. -Has a great colour, Phil, love the pilasters, as well. -There's an Arts And Crafts panel there. And this is probably the most unusual thing of the lot. This is from a 1930s seaplane. by the side of your chair. and all these little bits are from the cowlings of the seaplane. There is, however, one more item, just have a look at this, then. Because we bought these two staddle-stone bases here. They must be... I mean, they went out with modern farming. and I think we've all together bought some good things. There's not a lot of stuff on their little table that I would like. I loved that little propeller stand, don't you? -The hedge trimmer, that was fun. than their money invested in theirs. Who am I behind? Team Ball. And I think we're going to slaughter them at the auction. for an auction at Watlington. Big day, Johnny. How you feeling? I think we might make three or four pounds. Maybe add a couple of noughts on that. Oh, that'd be lovely, we'd do it. Look at this region we're driving through now. made for a gateway like here, wonderful. -Or they're great ram-raiding posts. where we're online this morning. makes of their rather large collection. There's the staddle stone bases. Now, they are just remarkable. rather than just half a barn. People like that sort of thing, so we should do quite well with those. Only wish we knew which sort of flying boat it was. for a total of just £195. While John and Phil spent £275 on their six lots. This is quite a place, isn't it? Please take your seats, fellas. -This beats a hard-back chair, doesn't it? We've just popped in to see what's going gone. Ta-dah! On that note, let's start with Johnny's Bretby jugs. -And they cost us 35. That's a good start. Sorry! And they were very cheap! What can we say for those? £40 or £50? 30 to start me. £30, £20, the Bretby. -15 to start. Dear, oh, dear, you are a tight lot. Yes, we have got two. £30. £20. 10, then, to go. Oh, dear. Somebody must buy them for 10. They've got to go. I can't go down any lower. Five, then, to go..
-Eight, £10, at eight pounds, then. HE BANGS GAVEL Oh, no. I'm sorry. Not an auspicious start for those two. I don't know what you think, John, but that's really sad, isn't it? Well, that's a bad start, isn't it? Depends on your perspective, it's quite a good start for us. will wipe that smile off Phil's face. 30 then, start me for the pieces. 15, I'm bid, 18 anywhere? 18. 20? 20, I'm bid. 22? At £20, then, you all happy at 20? Nobody seems to want Steiff for £20 then all done at 20. -Cheap at twice the price. -We've been done. He's right, we've been done. You've been done very well, though, Johnny. They don't seem all that bothered. I thought Watlington would have been more discerning. -Precisely. That's what they are! John and Phil's turn. Mandolin. £30, I'm bid, 32 anywhere? £34, then. You all happy at £34? Not quite as bad as the previous losses, though. Next, will one of John's country lots appeal? 15, I'm bid. 18 anywhere? £15, you all happy at 15? All done then at 15. -Goodness me, I don't believe it. Blimey, John and Phil have lost less so far, but they've staked £80 more. -this was all about the highs and lows. -Can I just ask when will the highs be coming? Time for some items Johnny was especially passionate about. Let's get back in the game, Johnny Ball. -Let's gets back in the game, OK? -Don't tell them it's us. Most celebrities aren't shy about that, Johnny. What can we save for those? £30-£40? 20 to start? £20, I am bid, 22 anywhere, before I got to the phone? Coming to you now at 22.
it's against you all in the room at £30. All done. Good buy. I mean, goodbye. On the bright side, it's their smallest loss yet. Ha! and buy things and make money at an auction, that's the way it works. We got the first bit all right. Hang on, John, this isn't it. -No, it's not us, though. Oh, I thought that was ours! Oh, here it comes now. Now for reality. What shall I say for that? 130 then. Behind me at 130. All done at 130. -Not quite as good as your 250, John, but it will do. It certainly will. A proper profit at last! This fire screen's one of John's, too. Stand by. Dear, oh, dear. You are a tight lot. 30 then to start me. 30, I'm bid. 32, 34? At £32, then. 34 anywhere? -At £32, all done at £32. and it's about time that Johnny and Charles made a good call. -to call Mrs Hanson, couldn't you? 20, then, to start me. £20 I'm bid. 22 anywhere? You all happy at 20? All done at 20 for the two telephones. £22, then, standing by the door. All done at 22, I've already got mine. At £22. Whatever Watlington wants, our chaps cannot supply it it seems. What is all this doing for your reputations? -We never had a reputation! He's seen this programme before. but can the mirror succeed? -What, you mean like all the other things were fine? This is solid. This is a solid Victorian antique. Hold it up a bit, love. It ought to make £60. £90, then, with Alan at £90 for the wall mirror. All done at 90, with Alan. Yeah, big hand, Phil, an expert comes up trumps. Now, Johnny wasn't keen, but Charles insisted they bought this box. 20 then to start me. Dear, oh, dear. Nobody into railway et ceteras? 15 to go? -15. Somebody must buy it for 15.
Who likes to buy unusual things? This is nice and unusual. 10, I'm am bid. 12 anywhere? £10. You all happy at 10? Highly disappointed in the settee, I'll wager. You more or less broke even. Yup! It's a minor triumph, really. I'm disappointed, Johnny, I'm sorry about this. Look at me. Look at me! Well, look at those, then. and if they don't make a loss, they'll almost certainly have won. Could you hold them up, please? Imogen didn't have quite enough Shreddies for that this morning. -80 or £90, start me for them? 90, 95 with you. 95, I'm bid. At £100, then. You all done at one? They'd grace any stone...henge, I'd say. Now for Johnny in Charles' lighter and buttons. Can they finally turn a profit? -You should double your money, shouldn't you? We need a good ending. We need a happy ending. End on a high. Come on. 40 then to start me. -£20, I am bid, 22 anywhere? All done at 20 for the four buttons. I think the result is pretty clear. they made a loss of £104.80 leaving them with £295.20. made, after paying auction costs, a profit of £53.82. So they are today's top team with £453.82. -You win some, you lose some, don't you? -No, I lose them all. -Johnny, great to see you again. -Never enjoyed wasting money so much. -We've still got this car for a little while. -Well, I can't promise that. That was quite an event, wasn't it? -We really enjoyed the trip, didn't we? -It was worth it for this alone. 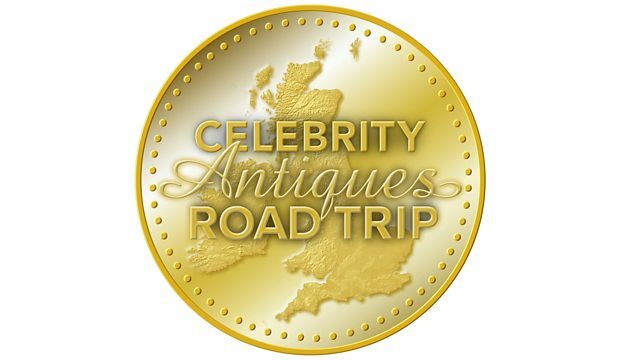 Two groundbreaking TV presenters join the Road Trip in a search for antiques. John Craven and Johnny Ball are assisted in their quest around Hampshire and Dorset by experts Charles Hanson and Philip Serrell. Along the way, John from Countryfile is treated to a collection that once belonged to a father of modern scientific archaeology, whilst Johnny has a go as a member of the Royal Signals.